In remote villages and urban slums, an army of experts and committed volunteers is fighting what could be the final battle in an age-old war. With adequate funding and much perseverance, they may soon wipe out the last trace of an enemy that has plagued humanity for thousands of years. This is the war on polio. THE LAST CHILD tells the behind-the-scenes story of the global campaign to eradicate polio, the dreaded childhood disease that continues to cripple and kill. From the frontlines in Nigeria, India, Haiti and elsewhere, you'll witness the victories and challenges of trying to wipe out a disease worldwide for only the second time in history. The polio eradication campaign is the largest non-military, global enterprise ever. It involves dozens of organizations, scores of governments, thousands of health workers and millions of volunteers. In a world of AIDS, malaria and other health crises, the eradication of polio would demonstrate that humankind can triumph over the darker side of nature. The campaign has made remarkable progress, reducing polio cases from 350,000 a year to fewer than 1,000 in just over 15 years. Yet, as THE LAST CHILD shows, health workers face major obstacles in defeating the virus once and for all. Some communities are refusing polio immunizations. The vaccine is developing dangerous mutations. And some experts now question whether polio can ever be eradicated. But the cost of failure would be staggering. If the campaign loses steam and immunization rates drop, polio could quickly re-emerge and threaten a whole new generation of children, even in places that have long been polio-free. "Watching The Last Child, I found myself taken back to those days in 1949 when, as a polio victim, I spent nights in an overcrowded New York hospital amid hundreds of stricken children. Some, like myself, could no longer walk; others, much worse off were in iron lungs. But this film tells a story not only of the persistent efforts of doctors and volunteers to interrupt the contagion of the virus, and of the great hope of eradicating the disease totally from the face of the earth. It shows how we are so close to this great goal, if only the last steps are taken. There is so little to do, and so little needed that the horror exists that we will be too complacent to do it. It is an engrossing and moving film and hopefully will inspire us to take this final step to reach that last child." "The Last Child is a riveting documentary that shatters the notion that polio is a disease of the past." "The Last Child showcases the heroic efforts that have brought us within reach of the goal of eradicating polio, a vile disease preventable with a vaccine costing a few pennies. For most of us in the United States, polio is a distant memory, but this film shows the difficult obstacles that remain and why we must do whatever it takes to overcome them." 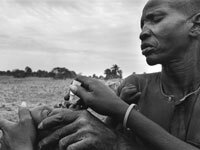 "If you doubt that heroes still walk the earth, you haven't seen The Last Child: The Global Race to End Polio. This moving record documents the heroic efforts of many millions of people worldwide who, though they may look like you and I, have very nearly triumphed over nature and eradicated one of the worst plagues of mankind. But the film also carries a warning: this is a tenacious virus; let it live and it will thrive. And we will be back where we started." "The aspect of this remarkable film that struck me the most was not the daunting numbers nor painful stories of how many individuals, around the globe, have been touched by polio. Rather, The Last Child left me with images of the unparalleled generosity, energy, and complete sacrifice demonstrated by volunteers mobilizing to educate communities...to test individuals...and to slowly, painstakingly, house-to-house and person-to-person, eradicate an entire disease. The inherent potential and strength in this initiative is a powerful force." "Eradicating polio is one of the most ambitious public health programs ever undertaken. The goal is tantalizingly close but, as The Last Child makes clear, it is a daunting task, one fraught with political, economic, cultural and logistical challenges. Yet, each glimpse into a frightened child's eyes - and there are many here - reminds us that no effort should be spared. The day the last polio-stricken child is identified will be the first day of a better world." "An informative, eye-opening documentary about courageous and compassionate people fighting a war against a disease many believe doesn't even exist anymore. The film may get people proactive in the fight against this horrific disease." "Here in the U.S., we've almost forgotten the grip polio had on our nation during much of the last century. Today in the developing world, however, the disease continues to cripple and even kill thousands of children. The Last Child will help increase public awareness of the polio eradication efforts and demonstrate the need for continued public support." "As The Last Child will demonstrate, the experience from this worldwide effort may hold valuable lessons for combating other diseases threatening our world." "If we do not grasp this window of opportunity to eradicate polio by 2005, decades of progress could be lost and indeed, the opportunity lost forever. This documentary will provide an excellent opportunity to share the progress of the polio eradication campaign, and the challenges still being faced." "It is vitally important that efforts are made to heighten public awareness of the Global Polio Eradication Initiative, particularly now as it enters its final and most critical stage. The number of polio cases has decreased worldwide by 99 percent since 1988, proving that things can be accomplished when world forces join together for a common cause." "The Last Child, is an important contribution to documenting this incredible international campaign to eradicate a disease. Photographing the campaign in several countries in Asia and Africa showed me again that people can achieve positive change if they join together. If this film helps to create more discussion and commitment for efforts like this, it will have achieved its purpose." "As a young teen, I survived a brief bout with polio, and I have seen the disease impact others close to our family. My hope is that this film brings us closer to a happy ending in the battle against polio." "Scott Thigpen's courageous and substantive documentary The Last Child provides a jolting sense of immediacy regarding a disease most Americans believe to be long eradicated from this fragile world. The film seamlessly assays the myriad difficulties in combating this global problem with a refreshing lack of excess. This is advocacy cinema at its purest level, and therefore, at its most affecting. The Last Child is a precious document, and necessary viewing for those who still value humanity." "Highly recommended for high school media centers and college and university libraries with courses in public health and the health sciences. Public libraries will also find it useful for their collections." Special Features include * 6 Short Bonus Videos: The Cold Chain, Lab Containment, Smallpox and Polio Eradication Efforts, The Last Case of Smallpox, Sebastiao Salgado: Awareness through Images, Portrait of a Volunteer * 2 Photo Galleries featuring the work of two of the world's leading photographers: Sebastiao Salgado and Jean-Marc Giboux * Interactive Timeline tracing the history of polio from 1350 BC to today.